De La Rue Malta goes from strength to strength as its new product authentication facility was today opened by the Prime Minister of Malta. The new facility will produce tax stamps, authentication and brand protection products, including brand protection labels for Microsoft, one the world’s most famous brands. De La Rue’s Malta factory which employs 567 staff, is a centre of excellence across all three of its portfolio areas – Currency, Identity and Brand Protection. The new facility marks the completion of the 27million Euro investment that started two years ago. The Hon. Prime Minister of Malta Joseph Muscat opened the new facility and was joined by the Hon. Minister for the Economy, Investment and Small Business, Chris Cardona, De La Rue International’s Chief Operating Officer Bryan Gray and De La Rue Malta Director Edward Chetcuti. “Today gives me real pride because it is another important milestone in our journey in Malta that stretches back more than 40 years and the teams working here are the very best in the world at what they do. 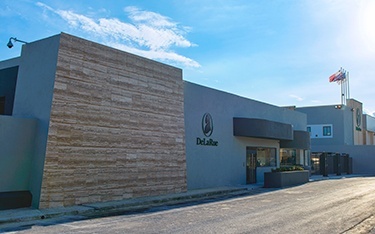 The new facility is a key milestone in De La Rue’s business strategy as the currency and authentication business grows significantly year on year and the identity business shows massive growth. Our order intake figures for the year are £533 million, a 16% growth in order intake from last year, with accelerated growth in the key areas of security features (up 60%), Polymer (up 23%, Identity (up 36%) and PAT (up 97%). This gives us real confidence in our strategy and provides solid momentum into next year. De La Rue is committed to its business in Malta and sees it as a central part of its international strategy. Only last month De La Rue signed an agreement with the Malta College of Arts, Science and Technology, to collaborate on new training programmes in printing and secure printing.